The ICE506 Instant cold compress is a single use compress that works by breaking the inner liquid pouch. The resultant chemical reaction produces an instant cold compress. The compress stays cold for up to 40 minutes and produces temperatures of -5 degrees Celsius. The ICE506-BOX is small and more compact making it ideal for small first aid kits. An ideal product for field applications where a refrigeration source is not available. 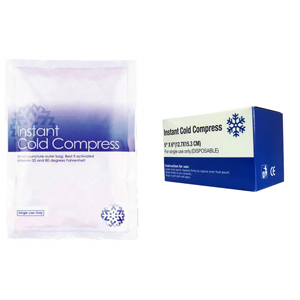 The ICE506 Instant cold compress is a single use compress that works by breaking the inner liquid pouch. The resultant chemical reaction produces an instant cold compress. The compress stays cold for up to 40 minutes and produces temperatures of -5 degrees Celsius. The ICE609-BOX is small and more compact making it ideal for small first aid kits. An ideal product for field applications where a refrigeration source is not available. 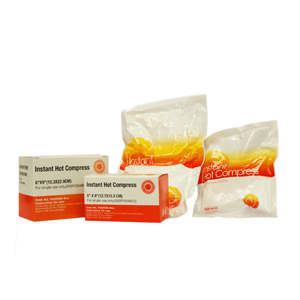 The HOT609 Instant hot compress is a single use compress that works by breaking the inner liquid pouch. The resultant chemical reaction produces an instant hot compress. The compress stays hot for up to 25 minutes and reaches a temperatures of 55 degrees Celsius. An ideal product for field applications where an artificial heat source is not available.